In Toltec tradition, the Toltecs arrived “from the west” to occupy Chichen Itza. Their immediate migration was from Mexico City, which is west of the Yucatan Peninsula, but the reference may be to more ancient roots in the Pacific. From the following article by Richard Cassaro, May 14th, 2012, it is obvious that the Mayans/Toltecs were part of a culture that had widespread influence. It demonstrates that the Mayan and Balinese cultures were from a single source in spite of being on opposite sides of the Pacific (Central America and Indonesia) . in their architecture, iconography, and religion are so striking and profound that (they) seem to have been twin civilizations—as if children of the same parent.” Among the many similarities between the Toltecs and and the Balinese, both built a step pyramid of similar design complete with the descending serpent stairway. Both cultures also depict a fearsome god in exactly the same pose holding a club. This is the ‘howling monkey god’ of the Mayans: their god of the arts and music, and of sculptors and scribes: the repository of civilization. Below left is the monkey god, Vali, of the Indonesian island of Bali, and below right is the Hindu monkey-god, Hanuman, from Kishkindha, India, roughly 3,000 miles to the north west of Bali. Notice the similarity in theme and pose in the picture on the right. I said exactly the same pose before. To see that, visit the article by Richard Cassaro. Not only Hanuman, but Sugriva, Vali’s younger brother, served the kingdom of Kishkindha. I believe we have a clue in the name of this kingdom. “Kindha” sounds like a root from which we derive “India” today. That leaves “Kish”, which would pretty obviously be Kush. Kindha also sounds like “kingdom”. This would make Kishkindha the kingdom of Kush on the subcontinent of India. Kush would have had other kingdoms as well. Bali, Egypt, and South America seem likely at this point, to name some. And also in North America (see my Skinwalkers – Extraterrestrial? series). Below are images of Hanuman carrying the club in his one hand while holding a pyramidal rock on the palm of his other hand. This pyramidal object takes us back to the worldwide pre-sanskrit culture, which made use of a 10″ tall pyramidal object (and see the Pyramid of the Eye). It has a star-cluster depicted on its base along with some pre-sanskrit writing said to mean, “The son of the creator comes from here.” That is said to be the translation of Professor Kurt Schildmann, President of the German Linguistic Association and fluent in over forty languages. Klaus Dona analyzed the artifact, which was found, he says, by someone, “in 1984 while gold digging in Ecuador in an underground tunnel system.” The cache discovered included another 350 artifacts, none of which seem to fit any known and existing South American pre-Columbian culture, says Dona. Dona believes the star-dots on the pyramid’s base depict the constellation known to the modern world as Orion. This is likely true, but the dots on the object don’t align accurately to the stars in the belt and dagger of the constellation. as we see it today. 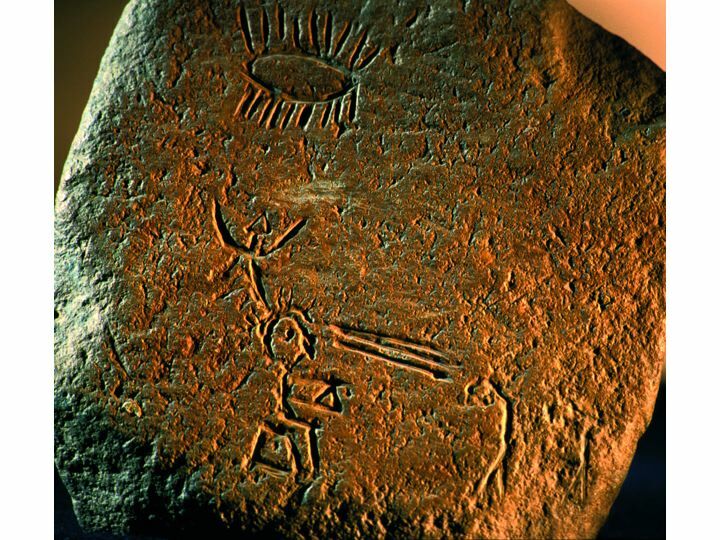 However another object, found together with the pyramid, may be used as a key, since it undeniably does depict Orion. It configures the stars in Orion in the same way as the pyramid object does. This demonstrates that the stars on the pyramidal object do depict Orion. This second artifact is of interest in its own right, as it expands on the story. It includes two carved figures gazing at the heavens with the stars Pollux and Castor (from left to right) between them, perhaps identifying them. Judging by the position of these stars, the larger figure to the camera’s left would be Pollux and the smaller would be Castor. They stand on a panel that presumably depicts what they are looking at. It depicts the region of the sky around what is known today as the Winter Triangle (Procyon, Betelgeuse, and Sirius), and it includes several constellations. Oddly, although all three stars in the Winter Triangle may be present on the plate, and although a triangle is indicated by three large dots in the middle of the plate, it is not the Winter Triangle that is highlighted. For one thing, the triangle on the plate points northward, but the Winter Triangle in the sky points southward, as can be seen in the screenshot below. The northernmost point in the triangle on the plate is the Castor/Pollux star pair that is between the two figures. The northernmost star in the Winter Triangle is Betelgeuse; but on the plate Betelgeuse forms the bottom right corner of the triangle. It is the star in front of Castor, with the belt and dagger of Orion below it. To the right of Castor is a star and then at the very right-most corner of the plate, is the Pleaides star cluster (the 7 sisters or fates). The star and cluster are part of the constellation Taurus, which if it were completed on the plate would be partly under the feet of the Castor figure. The so-called Silver Gate (from whence the gods were thought to descend from the heavens), which rests between the horns of Taurus would be behind the smaller figure, but it is not part of the artifact. Thus the smaller figure may depict Taurus. Call it Castor/Taurus, guardian of the Silver Gate. The third large dot forming the equilateral triangle on the plate (this one is in front of the Pollux figure) does not seem to be Procyon. But if it is not, Procyon is completely missing. The third large dot seems to be Alphard, which along with the stars to its left on the plate may form part of the constellation Hydra. If so, then Hydra is what was important to the artificers, and not Procyon and its constellation (Canis Minor). The plate is not drawn to scale, but the star positions are relative. If the above analysis is true, the artificers took some intentional liberties in order to tell their story. The following idea plays off this. The group of five stars at the left corner of the plate may not be part of Hydra. The tail of Hydra points off toward Scorpio; and the five stars align well with the tail of Scorpio. This is located at the so-called “golden gate,” which is where the gods were thought to go into the heavens when ascending. So we will call the larger figure Pollux/Hydra. And if Scorpio is in play, we can add, keeper of the Golden Gate. And finally, the plate does seem to depict Sirius, although in a minor capacity. It would be the upper of the two stars below and to the left of Orion. Sirius is the major star in the constellation Canis Major. Another artifact, a cup, was also found at the site. It is part of a set of 13 cups which set has some remarkable attributes in its own right. 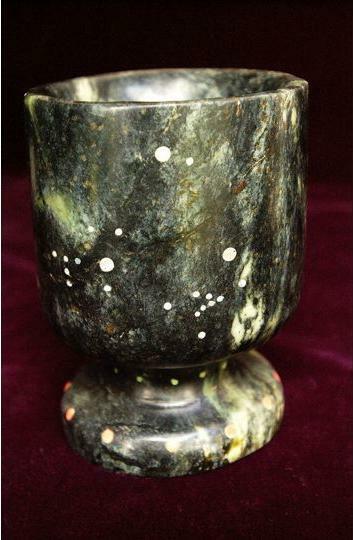 But our focus here is that the cup depicts the same star chart as the panel. The cup depicts the same triangle as the plate, although the stars in Orion are configured differently than the other two objects. But comparing the panel to the pyramid, it seems clear that all three objects depict Orion. I had to consider the Pleiades for the pyramid stars, since the Mayans regard the Pleiades as the source of material reality and power – but the dots don’t fit. I ended up concluding that the best fit was the belt and “dagger” of Orion (which is what Klaus Dona said in the first place). 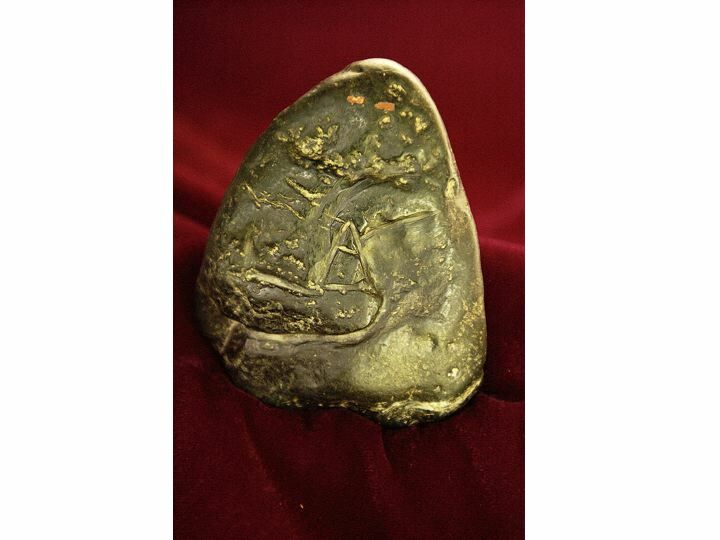 The depiction of Orion on the pyramidal object leads to the speculation that it belonged to and was used by an earthly figure that the constellation of Orion represents. Primary iterations of that figure on earth were Osiris, the prototypical pharaoh of ancient Egypt, and Horus his son. Osiris or his offspring not only ruled in Egypt, but seems to have been quite active outside of Egypt, and was given many names in many cultures, and many overlapping stories were attributed to him/them. Some say that Osiris was Nimrod, but he may have been Kush, or even Ham – father and grandfather of Nimrod, respectively. They are all closely associated due to this being the lineage that rebelled against and usurped the authority of Noah. Since Kush is the one said to have traveled the world to evangelize for their new order, below I will just use the name Kush. At any rate, if I am not mistaken, Kush had a unique and particularly close friend in some of these stories. It seems likely to me that on the Indian subcontinent that friend was Hanuman, who was completely devoted to the Lord Rama. As in the Indian stories, Hanuman serves the the incarnation of Vishnu as Lord Rama, so we may be able to translate this to middle eastern stories of the friend of Kush. The pyramidal rock held by Hanuman, (judging by the various images of it) seems to represent kingdom as an archetype of civilization . It is as though Hanuman holds the power of the kingdom – the civilized world – in his hand. This idea of the transmission of civilizing power through a pyramid is generally consistent throughout the world. It is certainly consistent with the Great Pyramid in Egypt and with the Mayan concept already mentioned in which material reality and power come from the Pleiades to the earth through their pyramid. This use of the pyramidal object seems to be depicted in another petroglyph as well where the whole rock depicts a seated figure (with two eyes inlaid at the top) holding a pyramid object. There is also an ancient brass helmet with a sort of dish antenna that seems to have been used in the fashion pictured above. If these things be true, it appears the hand-held pyramidal object is also depicted in what could be called power-figure petroglyphs found in several places around the world. These portray a giant figure with antennae holding a spiral in one had and a pine tree shaped object in the other (See my discussion of this, why the figure also holds the spiral, and what it may have to do with our present time, here). Demonstrating another thread of commonality, all three of these cultures – the Indian, the Middle Eastern, and the Ameerican – also depicted yogic practices as well as the third eye in the forehead. Perhaps the holding of the hands, palms together with the fingers pointing up, is intended to replicate the pyramidal power described above. Hanuman in sanskrit means, “having a large jaw,” which phrase could just as easily describe the Mayan as the Balinese gods depicted. The mythical Hanuman was a genetic cross between a monkey and a celestial being. He is written about in the Ramayana (ascribed to India’s first poet) and the Mahabarata. The Ramayana is considered by some to be older than the Mahabarata, and thought to be from the second of the four eons of Hindu chronology, although opinions vary. The Vedas, which were Sanskrit texts, predate it. Given that the writing on the Ecuadorian pyramid is pre-Sanskrit, and other depictions we have reviewed are stone age, the use of this form of pyramid power must have been very early. Hanuman is an important character in the Ramayana. He is a vanara, or ape-like humanoid, a member of the shape-shifting “monkey” kingdom of Kishkindha. He is portrayed as the eleventh avatar of the god Shiva (He is also called Rudra) and an ideal bhakta (devotee) of Rama. He was not the first of his kind, although through his mother he gained special qualities. He was born to Kesari, a vanara king, and the Goddess Anjana (http://en.wikipedia.org/wiki/Ramayana). The vanara had been created by the gods, at the instruction of Brahma, to be warriors for them. The vanara organizes into armies and spread across the forests of the west-central part of the Indian sub-continent, although some, including Vali (also known as Bali – the namesake of the Indonesian island – and in Indonesia known as Subali), Sugriva, and Hanuman, stayed near mount Riskshavat. Bali was a king of the monkey kingdom, Kishkindha, and a son of Indra, and the elder brother of Sugriva. Here is a picture of Vali showing a beard looking like the jaw-teeth in the Mayan depiction. Hanuman, Sugriva, or Vali and the monkey god of the Mayans may not have been the same person, but they are clearly the same class of person from a single unified cultural root. The island of Bali is connected to Chichen-Itza, not only by the architectural tradition represented by their pyramid temples, but by their monkey-gods as well. The Ramayanah in describing this “genetic experiment”, and the fact that the hand-held pyramidk points to the stars, reminds one of Genesis 6:4 in the Bible, and of Enoch, chapter 7, which taken together depict an angelic leader persuading a celestial company to descend to earth, take earth women, and sire offspring – the giants, or mighty men of old. While it is probably not be the same event, it is certainly the same type of event. Another legendary figure of the ancient world who was typically depicted with a club is the Greek hero Herakles (Hercules to the Romans). Herakles was the archetypal hero. This was a class half-lings, crossed between the gods and mortals, exalted above typical mortals, but who by exceptional prowess stood in a strata between the gods and men. Like Vali and Hanuman, Herakles could have been a species like vanara. I haven’t studied the connection in detail, but the adventures of Hanuman may be the same exploits attributed to Herakles. The stories we have reviewed, in spite of being from three continents, all seem rooted in the tradition begun by Ham, Kush, and Nimrod when they usurped the authority of Noah and converted the world to their magical way. This was a tradition which, among other things, brought angelic beings and earth beings together in a genetic mix that produced the heros and “mighty men” of old. Adding to the images of Kukulcan and Hanuman, another image (in the following link) was clearly part of the lexicon of ancient cultures in every part of the world. It depicts, I believe, the “pillars of Hercules”. It stood as an emblem of Kush as he passed through the pillars and traveled the world as messengers of the gods, spreading their occult practices to all peoples. The figure in the middle of these ancient images is a god or goddess, really having the nature of both; often winged, and at least once depicted with the legs of a four footed beast, not a human. It is a fertility figure, and at least once is depicted giving birth. It has its arms outstretched to the right and the left holding variously a pair of pillars, staves, “wheat”, serpents, dragons, beasts, and humans – all pretty much expressing the same thing; that it controls the powers of this world in order to bring forth bounty. Then the link goes on to show gnostic medieval depictions of the same, which shed interesting light on the subject and how Masonry and Illuminism seek to carry it forward and bring back the powers it represents. According to Luis B. Vega, the imagery of the Phoenix Bird descending the stairs at the Chichen Itza pyramid is similar to Venus. In ancient & current world cults, the planet Venus is the Phoenix. On May 20, 2012, the Annular Solar Eclipse marked a conjunction between the Sun-Moon-Pleiades. A 2nd Solar Eclipse occurs on Nov 13, 2012 that marks a conjunction between the Sun-Moon-Serpens. These two Solar Eclipses in 2012 physically represent on a smaller scale the gigantic Galactic (Milky Way) Serpent, Orobulos. The May 20 Annular Eclipse is the ‘beginning’ one –having the first association with the ‘Serpent’ Phoenix with Venus. The ‘end’ one, a Total Solar Eclipse will be associated with another ‘serpent’ in Ophiuchus. Ophiuchus happens to be now the new 13th Zodiac sign. To the occult, it is now associated with the coming of the Anti-Christ, perhaps by the events leading up to the Winter Solstice on Dec 21, 2012. See the ‘Age to Come’ study (here) The luciferians see these 2 Solar Eclipses as a pronouncement of the Anti-Christ nonetheless; a sort of esoteric Alpha & Omega for the announcement of the Anti-Christ coming signature to be accompanied by ‘signs & wonders’.